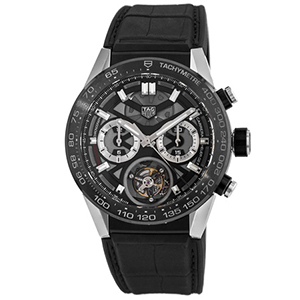 Tag Heuer Watches are proudly offered at Matheu’s Fine Watches & Jewelry. We offer the largest selection of TAG Heuer watches, featuring the ever popular Carrara watch designs, sure to please even the most meticulous of shoppers. 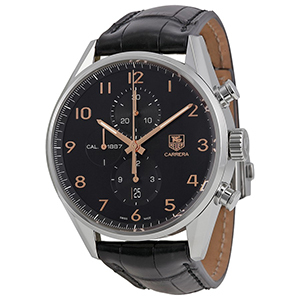 Matheu’s carries the entire line of TAG Heuer timepieces and is an authorized dealer. Matheu’s is also the only certified TAG Heuer watchmaker in Colorado. Matheu’s is the place to find a watch that will showcase your refined style and appreciation for classic and exceptional design. Visit one of our in store boutiques located in Highlands Ranch, CO; and Breckenridge, CO; where our highly trained family of watch and jewelry experts, will be happy to assist you in choosing the perfect timepiece. Boasting a contemporary spin on timeless elegance, TAG Heuer’s Carrera watch is the industry standard in precision design. Originally created for race car drivers, the Carrera watch was built to withstand the intense vibrations experienced during a race, while still presenting itself as a distinct and exquisite choice in timekeeping. With over 150 years of excellence, TAG Heuer has solidified their place as the chosen watch of celebrities and presidents alike. An iconic piece which speaks for itself, TAG Heuer is a must have for today’s fashion savvy professionals, who seek to partake in a revered tradition of cutting edge design, unsurpassed functionality and a time honored fashion statement, worthy of the limelight. The world’s most up to date manufacturing affords the Carrera watch the ability to measure time to 1/100 of a second. The first Swiss watch in space and the chosen timekeeper of the Summer Olympic Games in the 1920s, TAG Heuer watches are world renowned for reliability, durability and recognized excellence in performance and design. Named after the Carrera Panamericana race, a dangerous race which took place on the roads in Mexico in the 1950s, only the Carrera watch could do the name justice. Impossibly fast, beautifully assembled and worthy of national recognition, TAG Heuer’s Carrera watch is sure to impress. Matheu’s Fine Watches and Jewelry is also a TAG Heuer Authorized Service Center. Rest easy, your treasured timepiece will be carefully and thoroughly serviced by our highly trained experts. Owner, Scott Matheu, has been a TAG Heuer Ambassador since 1995. At Matheu’s Fine Watches and Jewelry, we stand behind the quality and integrity of every fine piece that is sold. Matheu’s is more than just a seller of TAG Heuer watches, we are the authority on them; possessing unrivaled knowledge, pride and professionalism, to that of any other store in the Denver metro Area.